To discuss the gas attack in Damascus, I have lunch with Asma, the wife of President Assad. We meet at Il Circo restaurant, at the Four Seasons Hotel, in Damascus. Asma was born in Acton, in London. Her father was a consultant at the Cromwell Hospital. Asma graduated from King's College London in 1996 with a degree in computer science and a diploma in French literature. Asma takes a keen interest in women's rights, education and the alleviation of poverty. I ask Asma about democracy. Asma says: "Obama should listen to the American voters. "The American people do not want Obama to support the terrorists in Syria." Asma frowns and says: "More people were killed in Libya after the so called liberation than before." Asma worries about the Christians in Syria. "Thousands of Christian refugees have found protection in Syria," explains Asma. "These people are at risk of being wiped out if the terrorists come to power." And what about chemical weapons? "At school in London," says Asma, "We were taught that the British used chemical weapons in World War I." "Italy used chemical weapons in Ethiopia. "The USA used chemical weapons in Vietnam and in Iraq. "I hope that we will never use chemical weapons." Assad, loved by most Syrians. I point out that survivors of the gas attack in Damascus are blaming the CIA asset Prince Bandar and his al-Nusra rebels for the gas attack. "Well, certainly we did not do it," says Asma. John McCain in Syria meeting al Qaeda. Asma notes that John McCain was in Syria, meeting rebels who are part of Al Qaeda. US military prepares to kill more innocent children. Reports Of Very Unusual Troop Movements In The U.S. And Air Power Massing In Cyprus. The Pentagon's Anti-Syria operations began in 2007, according to Seymour Hersh in the New Yorker. I suggest to Asma that there could soon be a false flag attack in Britain. This would be organised by the people who are angry that the UK is not going to bomb Syria's hospitals and schools. Asma says she certainly worries that further false flag attacks will lead to a full scale American invasion. "What happens then?" asks Asma. "Does Israel then grab a bigger part of Syria? Do Qatar and Saudi Arabia then get their oil pipeline through Syria?" 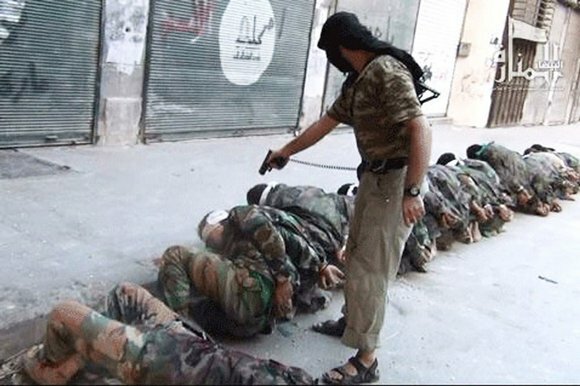 Obama's friends, the Al Nusra Front terrorists (Al Qaeda in Syria), execute Syrian prisoners. Over coffee I ask Asma about Obama. "I feel sorry for Obama," says Asma. "I think he had a difficult childhood. His family was a CIA family and those people have done some terrible things." We should point out that our Lunch with the FT series has no connection to The Financial Times. On the radio today a british soldier said many are very unhappy to have to fight another war for the jews, but how many will refuse to go ? Depleted Uranium weapons: Why shouldn't it be a war crime to poison civilians with radiation? Israel Lobbyist - We Need a False Flag to Start War with Iran! What is so strange is that the Queen of England greets the Syrian royal couple with a smile then stabs them in the back when it fits her purpose. It reminds me of the Wiley Coyote cartoons when he sees a chicken friend but then the camera pans to the coyote's eyes which shows a roasted chicken dinner on a platter. Do all heads of state fear they will be the next roast on the queen's menu?